Its Zee End of April's Blog Challenge. Thank you Alex for giving me this opportunity to test the little grey cells in my brain box. Parting is such sweet sorrow, so thats all folks. Hope you enjoyed the show! The spaceage marriage of convenience is coming to an end. Heres an early video of the Space Shuttle Enterprise in 'free flight' which landed a little shakily later on at Edwards Air Force Base. The Enterprise never actually lifted off up into space, instead here she is flying on her first and last voyages. Sniff, I feel so emotional. NASA officials were stumped by all the fan mail pouring through their gates in 1977 but the message was clear. The needs of the many outweighs the needs of NASA. Officials cleverly employed vulcan logic to counteract the trekkie storm which flooded in and engulfing its people. NASA updates about a space shuttle soon to be named after a world war II carrier called ENTERPRISE in honor of the original USS Enterprise NCC 1701 from Star Trek TOS succeeded in calling a ceasefire. It actually WORKED! Star Trek fans reached for the stars and their dream became a reality! The write in TREK CAMPAIGN WON igniting the human adventure with the Space Shuttle "Enterprise." In Star Trek's TNG episode '11001001' Commander Data paints Xylo Eggs. What do you think of them? Is Data exhibiting signs of pure creativity? Its hard to tell what Commander Riker makes of the android's painting but I think Captain Picard would have approved. The french like paintings flushed with vibrant bright colors. Painting is another way to keep a diary. Its hard to figure why Commander Riker departs so suddenly, starship duties I guess! Keep notes this project could be of importance to scholars in the future. Well of course, think about it. A blind man teaching an android how to paint. Thats got to be worth a couple of pages in somebodies book! W is for Wesley Crusher aka Wil Wheaton. Here he is in another timeline with his son Ryan graduating from college. V is for Star Trek villains! Its the big question all trek fans, trekkies and trekkers have likely asked themselves by now. Who playing the next big bad wolf in Abram's Star Trek? The word is Benedict Cumberbatch has replaced Benicio Del Torio as the big guns in Trek's mystery movie sequel. Cumberbatch is obviously playing the villain in J.J. Abrams new Trek's verse now confirmed by IMDB's Star Trek cast but you have to wonder...Whos he going to be in the movie? Heres a list of likely suspects for you to drool over. 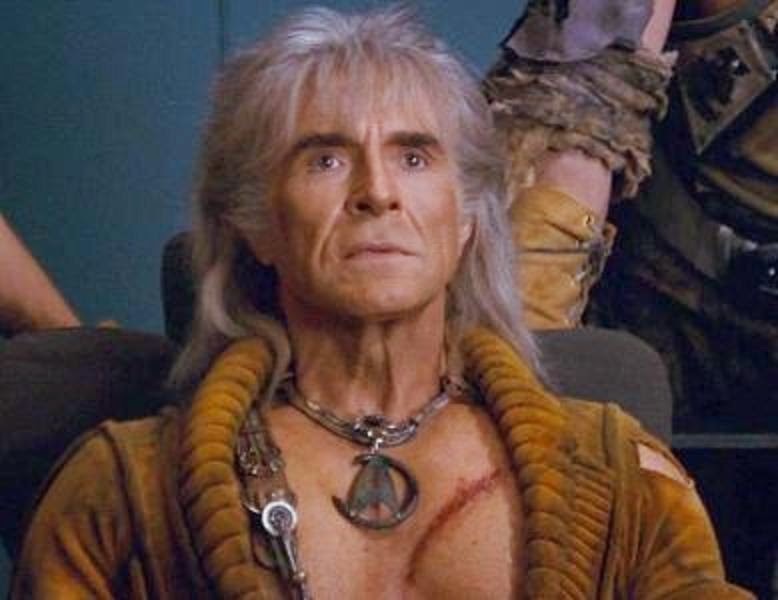 Khan Noonien Singh. The ex-prince of millions and Captain James T. Kirk's nemesis. Apparently Nero's interference with the trek timeline will alter Khans experiences with the USS Enterprise NCC 1701. 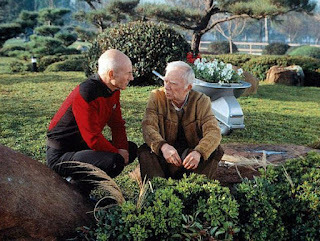 Its nice knowing years later, Khan still regarded Kirk as "his old friend" even though his cold calculating assassination attempt failed to take over the USS Enterprise NCC 1701. Do you really want to see Ricardo Montleban's character played by a younger actor pitted against the Federations good guys all over again? The Borg deliver a shocking cutting edge that make you want to sit up and pay attention. The Borg became the United Federations of Planets most ruthless enemy with the loss of 39 ships and 11,000 lives at Wolf 359. Captain Jean Luc Picard's capture and assimilation by the Borg struck a killer blow at the beating heart of the Federation. 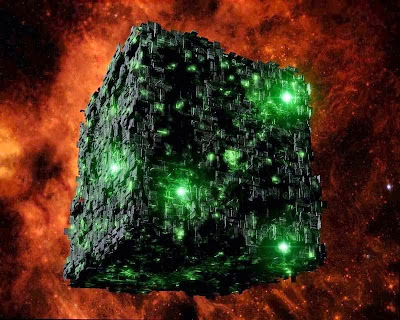 The Borg have one mission, one hive mind and belong to one collective. Do not cross the Borg unless pain is something you enjoy. Could the Borg be in Star Trek's new movie? The Mysterious 'Q' trickster is an all time favorite. Q loves testing and tormenting humans, we're become like pets to him. Q has no sense of timing either and nearly always sends Picard diving off the deep edge in sheer frustration. Q once told Jean Luc Picard that he was dead, this was the afterlife and I'm God. Picard refused to believe the universe was that badly designed! 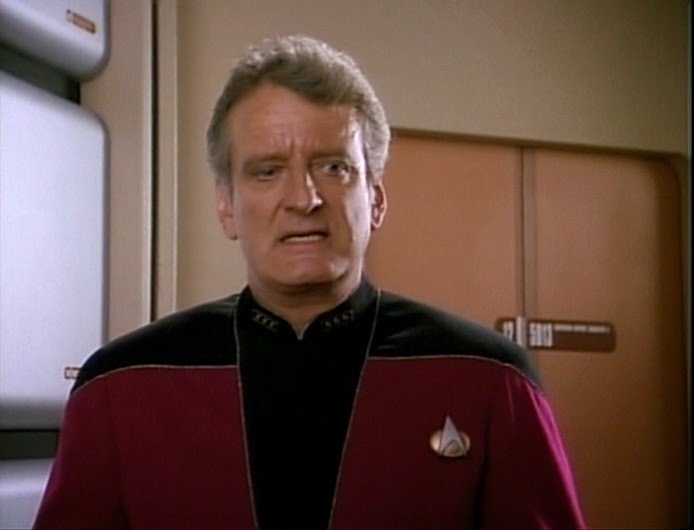 What do you think of John De Lancie playing Q the Grim Reaper, Mr Death in the next trek incarnation? Harry Mudd's misbehaving, ill deeds, heavy drinking and getting into trouble with the law eventually delivers Harry right into the hands of the USS Enterprise NCC 1701. Sweet talking 'Mudd the First' enjoys avoiding questions, cheating Federation justice and escapes from the nagging, exhausting clutches of his lovely wife Stella! Mudd's arcane bag of tricks separates people from their beloved possessions, passing off counterfeit currency and transporting stolen goods but ask yourself something: Could you really see yourself pulling the trigger on poor ol' Harry? Klingons! Have no fear when we Klingons are here! In 2267 aboard the K7 Deep Space Station, Korax the klingon called Kirk "an overbearing Tin Plated Dictator with delusions of Godhood and a Denibian Slime Devil." The klingon slagged off the USS Enterprise NCC-1701 which Mr Scott found totally unforgivable! Chekov was outraged but still Mr Scott ordered him to hold his ground, explaining that "everyones entitled to an opinion" so Chekov grudgingly sat down. The Klingon was undetered. "I didn't mean to say that the Enterprise should be hauling garbage, I meant to say that it should be hauled away *as* garbage." All hell breaks loose aboard K7 with Scotty throwing the first punch. Its interesting to note, Klingons were set to be cast in Star Trek 2009 but didn't make it into the movie. Which Star Trek villain will you be rooting for? U is for Star Trek UNIFORM. Heres an email fom Trekker fan David which trek fans should know the answer to. Why did Klingons change from the original blokes with beards and silver vests to the Worf types of today? You'll love the answer Brent Spiner (Data) gave which is a real Stumper. "You know The Original Series costumes were made by the actors mothers!" Now come on! I didn't fall for that, DID YOU? I heard the interviewers chuckling at his theory which was of course one of Spiner's gags. So the interviewer says "No but seriously." sadly Brent has to come clean. "NO" he admits, before finally having a quiet laugh himself. T is for T'kon Empire. In Star Trek TNG episode of 'The Last Outpost,' Commander Data gives a little talk to his to his Enterprise-D buddies. Captain Picard explains hes never heard the word T'Kon before. Data turns on a holographic projection covered with extinct alien looking T'Kon language. Apparently, the T'Kon Empire ruled the galaxy 600,000 years ago. According to legend, these planets were outposts of that empire, explains Data. So far so good, until the operations manager picks up one of the toys left behind by one of the kids. Gottcha!!! Its hilarious watching super- android Data struggling to free himself when his forefingers get STUCK TOGETHER! Data. What are you doing? Apologies, Captain. I seem to have reached an odd functional impass. I am, ah... Stuck. Then get unstuck and continue your briefing. Yes, sir. That is what I am trying to do... But the solution eludes me. S is for Zoe Saldana aka Princess Neytiri in Avatar, the highest grossing movie of all time. 33 year old Zoe is the gal in Star Trek's prequel and J.J. Abram's hush hush Star Trek sequel due out in 2013. Our new 'Uhura' has taken over Nichelle Nichol's job aboard the USS Enterprise NCC 1701 sniff. Shes now the head honcho in communications stealing our hearts and minds with her talented linguistic tongue. I already miss those "Hailing frequencies open, Captain" but hey at least we can warp back in time! The name 'Nyota Uhura' once translated means 'Star of Freedom' in Swahili. One of Star Trek's greatest mysteries is why Uhuras christian name was never even uttered in the classic series or movies until recently in Star Trek 2009. You'll remember Nyota comforts Spock on the turbo lift and later we see the two of them canoodling in the transporter room. 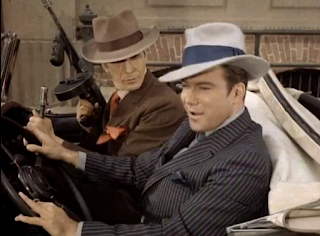 Kirks hounding of Mr Spock pays off big time when they're all on the transporter. The sly little vulcan finally says her name 'NYOTA' for the first time in the new trek verse ending decades of debate worldwide and random speculation in books. The question is how do you feel about more Spock and Uhura canoodling in the new Star Trek movie 2013? Perhaps Vulcan self restraint and the Pon Farr mating rictuals aren't so plain and hopeless after all? Logic dictates that under the circumstances the only logical action would have to be one of desperation. Logical decision, Logically arrived at. R is for Roddenberry. Twentyone years later after Gene Roddenberry's classic STAR TREK The Original Series, star trek fans witnessed a new beginning with Star Trek THE NEXT GENERATION. Its interstellar adventures established Captain Jean-Luc Picard replacing Captain James T. Kirk in the Enterprise driving seat. The shows creator, Gene Roddenberry worked several nights in a row without ever going home to sleep to make his dream come true. John De Lancie who plays Q in Star Trek TNG and Voyager, sheds light on a precious moment in time shared with the earthie who started it all. (You can watch it on Star Trek TNG dvds.) I gather Gene was in high spirits when he spoke to John about Q. So it must have been a great thrill for John to receive such praise! right? This is one you'll have to judge for yourselves. "You know, you make my lines sound so much better than they read from script" says G. R. in his kind gentle giants voice. -Well I'm glad so who are you? "So you must be the writer" replies John innocently.
" Well, who is Gene Roddenberry?" Q is for Quark but who is he? 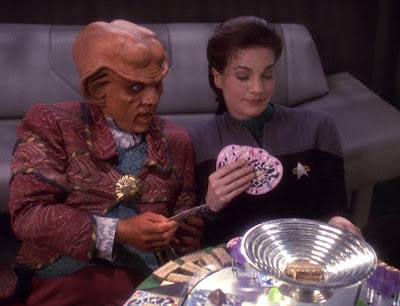 In Star Trek DS9 Armin Shimerman appears as the greedy Ferengi who runs the bar and gambling casino on the station's promenade. His love for gold pressed latinum constantly gets him into scrapes with the law. Shimmerman is an old hand at science fiction having starred in Beauty and the Beast and Alien Nation previously. 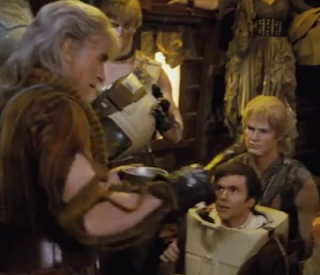 Armin initially had some misgivings about the extensive makeup required but a chat with Michael Dorn soon helped the actor come to grips with being stuck in a chair for hours. Shimmerman is definitely one of the more expressive Star Trek actors on Deep Space Nine but this fact is often missed because his face is always hidden behind a mask of gew. Quark also runs 'holosuites' where any fantasy of your dreams can be played out for the right price. Every good Ferengi follows the Ferengi Code with religious devotion from an early age. Years ago I snook in an extra rule into the Ferengi Code, can you spot which one isn't the real McCoy? What fantasies would you like to play out in Quark's holosuite? P is for the Picard Song! Heres Patrick Stewart live and in the flesh....SINGING an A to Z special in hilarious form! I've added the lyrics so you can have some fun and sing along! Its not often we hear the captain of the Enterprise-D singing a tribute for Star Trek's creator, Gene Roddenberry. I wonder could this be the same Jean Luc Picard we've all come to know, love and serve under during our galactic trek through the stars? Perhaps its high time to sing the Picard song? And ‘F,’ you’re a feather in my arms. ‘I,’ you’re the one I idolize. ‘J,’ we’re like Jack and Jill. ‘L’ is the love light in your eyes. M-N-O-P, I could go on all day. Q…’Q'? R-S-T, alphabetically speaking, you’re ok.
‘U’ make my life complete. ‘V’ means you’re very sweet. O is for Old Earth Satellite. The USS Enterprise NCC 1701-D encounters frozen bodies in Star Trek TNG episode of 'the neutral zone.' The strange thing is these humans died over 300 years ago on planet earth! All is definitely not what it seems. Data the android is fascinated by the 20th century Old Earth Vessel and is itching to investigate. Blackbeard reluctantly gives his officers the green light. 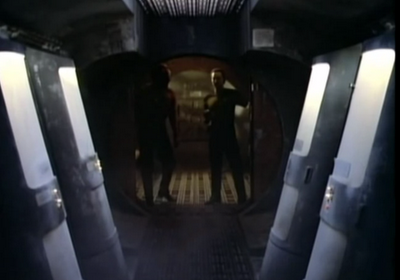 Together Worf and Data beam aboard only to discover three humans in a deep freeze cryogenic sleep! The question facing Data now is what to do with them? A mystery also surrounds the destruction of Federation and Romulan outposts marking the arrival of the United Federation of Planet's secretive neighbours, the Romulans after 50 years of silence. Captain Picard's return to the USS Enterprise-D reveals the man is not a happy camper. Data's and Dr Beverly Crusher shenanigans only makes matters worse. The good doctor has little choice but to thaw out the Enterprise's new passengers, apparently. Picard is unimpressed. I could not leave them there, Captain. The condition of the vehicle was deteriorating. But, Data -- they were already dead. I mean... what more could have happened to them? N is for Nomad but who or what is he? Nomad appears in an epic Star Trek classic episode of 'the changeling' voiced by Vic Perrin. In 2002 this ancient space probe leaves earth on a peaceful mission, to seek out new lifeforms!...... On its interstellar journey Nomad encounters 'Tan Ru' another of its kind. Quite by accident a merging of computerized minds unites and becomes one. A new far superior device evolves from the joining with an entirely new mission. To seek out and destroy! In a way this episode reminds me of V'ger from Star Trek The Motion Picture. Both machines are sentient however all is not what it seems. Neither Nomad or V'ger can comprehend human beings or our simple feelings! Despite Nomads vast knowledge imbedded into his data assimilation digital encoder, Earths 21th century space probe now believes humans are the enemy, imperfect in every way! We are to be exterminated! However, the machines mission of perfection soon proves to be its deadly weakness. It mistakes Captain Kirk for his creator proving once and for all, Nomad too makes human-like errors! I am the Kirk, the creator? You're wrong! Jackson Roykirk, your creator, is dead. You have mistaken me for him. You are in error. You did not discover your mistake. You have made two errors. You are flawed and imperfect and you have not corrected by sterilisation. You have made three errors. You are flawed and imperfect! Execute your prime function! Now. Get those antigravs on it. M is for Make it so! Watch for these signs, its easy to get hooked when Star Trek is warping through the galaxy on TV! Wide staring eyes, tingling sensation all over the body, hairs standing up on the neck, sweating hands and racing heartbeats are all logical indications that the nervous system has gone into sudden warp drive. The mystique appeal of future space travel and seeking out strange new lifeforms keeps us on the edge of our seats. You find yourself standing up to say "MAKE IT SO and ENGAGE" during the movie. Trek adrenalin floods the bloodstream sending your buddies into an equally euphoric emotional state, momentarily stimulating everyones cosmic thought pathways. 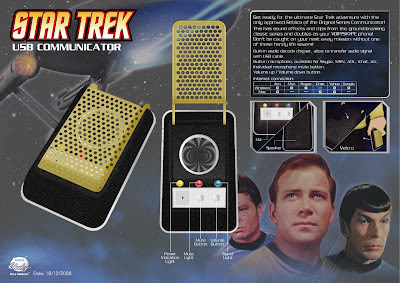 Is it possible Star Trek has engaged you? The situation is grim because now you have to explain your emotional outbursts. All indications are.....you might be a Trekkie! L is for Live Long and Prosper! There have been times when William Shatner's Kirk persona saved his neck just in the nick of time.. Once, scheduled to film an early morning desert scene, Shatner donned his Captain's uniform at home and drove his automobile at warp speed to make the set for the 4am deadline. "I didn't think there would be any other traffic," he says "There was. A police car with flashing lights pulled me over." When asked where he was going, Shatner replied "To My spaceship." The police officer sighed and sent him on his way. "Not without telling me to "Live Long and Prosper." K is for Kristina Kochoff who starred as an uncredited andorian n Star Trek TNG. In this episode of "the Offspring", Commander Data transfers android daughter Lal's entire process of existence into his own positronic brain. You see Data was Lal's father, creating Lal in 2366 using his own brain as a template. He nurtures and brings a unique sentient android (played by Hallie Todd) to life so he could have an offspring. All seemed jolly fine on the surface, once Lal chose her own appearance she was able to emulate humans and their odd behaviour, use verbal contractions and eventually exceed even the parameters of her own fathers sophisticated programming... Lal was able to FEEL......EMOTIONS! How could this happen? Starfleet's Patriarch Admiral Haftel beams aboard the USS Enterprise NCC 1701-D to take control of the Lal situation. Apparently he wants to acquire android Lal like you would a piece of technology, to study her. Haftel is a hard nosed, cold hearted brute who crushes Lal's emotional happiness. The cruel beast declares her the property of Starfleet without so much as considering Lal's personal needs. Captain Picard is horrified and objects but Admiral Haftel is adamant. 'I am Starfleet, Captain' growls Haftel at Picard through gritted teeth. Poor Lal. She never stood a chance and experiences extreme fear and confusion. The situation is grim. Lal returns to Datas lab just before the end of her life and then finally we understand why. "It just wasn't meant to be." A cascade failure in her neural net has caused irreparable, permanent positronic systems failure. Lal's neural net is slowly shutting down from emotional overload. Despite being capable of 60 trillion operations per second even her father Data cannot save her. Star Trek's 'The Offspring' really is a heart breaking episode. I believe Lal died because she was heartbroken! Data: "Lal? I am unable to correct the system failure." Data: "We must say goodbye now." Data: "What do you feel, Lal? Lal: I love you, Father." 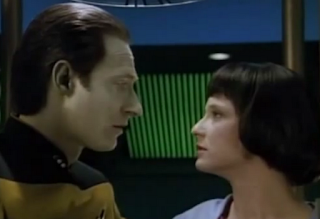 Data: I wish I could feel it with you." Lal: "I will feel it for both of us. Thank you for my life. Flirting. Laughter. Painting. Family. Female. J is for Jellic remember him? He completes a short stint in Star Trek TNG. In 2369 Captain Jellico is assigned to command the USS Enterprise NCC 1701 while Picard, Beverly and Worf get reassigned to a special black ops mission on Cestris III. 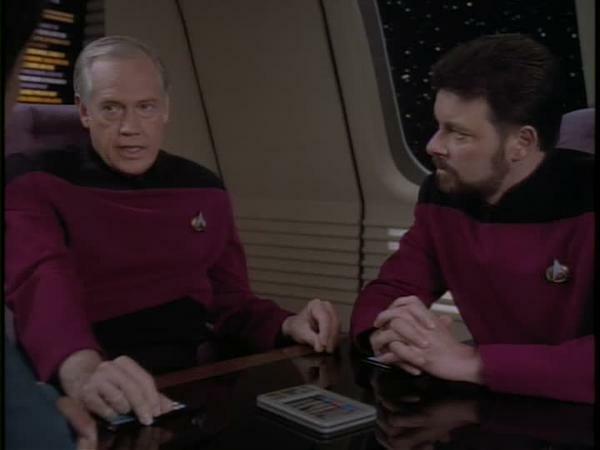 Commander Riker tries to communicate the crews concerns abouts Jellicos latest crew restructuring but its no dice. Jellico never raises his voice, but his tone becomes far colder and harder. You will tell the department heads that as of now, the Enterprise is on a four shift rotation. I don't want to talk about it. Get it done! I is for Ilia but who is she? 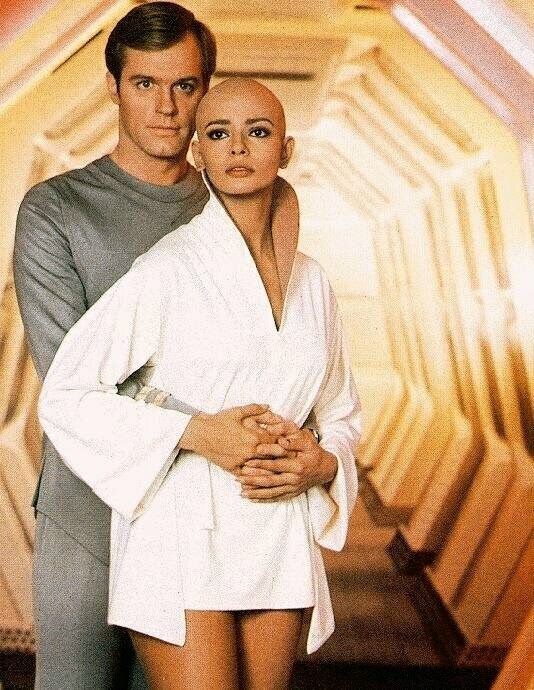 In Star Trek The Motion Picture we see a few brief glimpses of the beautiful Persis Khambatta who died tragically at only 47. Shes plays the first female officer to declare an 'Oath of Celibacy' aboard a Federation starship touching us with her empathic powers. We know from Ilia's chat with Captain Kirk that Deltan culture is dominated by sexuality in stark contrast to Khambatta's emotionless V'ger mechanism. V'Ger beams android "Ilia" aboard the Enterprise to communicate and learn about the humans "infesting" the USS Enterprise 1701 and planet earth. Ilia speaks for V'Ger now: "I have been programmed by V'ger to observe and record normal functioning of the carbon-based units infesting USS ENTERPRISE." Ilia: "V'ger is that which programmed me." Kirk: "Is V'ger the Captain of the alien vessel?" Bones: "Jim, what the blazes...."
Ilia: "V'ger is that which seeks the Creator." Bones: "Jim, this is a mechanism...!" Kirk: "Where is Lt. Ilia?" Ilia: "That unit no longer functions. I have been given its form to more readily communicate with the carbon-based units infesting Enterprise." McCoy: "Humans, Ensign Lang, us!" Kirk: "Why does V'ger travel to the third planet of the solar system directly ahead?" Ilia: "V'ger travels to the third planet to find the Creator." The women of Star Trek have rather more significant roles than those in other Tv shows watched by young audiences, like say Daisy in the Dukes of Hazzard. We had to wait until Star Trek Voyager arrived in 1995 before a woman took command aboard a starship. Its only fitting I suppose, that Star Trek is one of the first TV shows to deploy leading women on the front lines of Science Fiction. Who would you prefer to serve under, Captain Kathryn Janeway (ST) or Laura Roslin in Battlestar Galactica? H is for Harry Mudd but who is he? Harcourt Fenton 'Harry' Mudd is a slippery, charming con artist played by Roger C Carmel who appears in two Star Trek classic episodes, Mudds Women and I am Mudd. Mudd's arcane bag of tricks separates people from their beloved possessions, passing off counterfeit currency and transporting stolen goods but thats not all. Misbehaving, ill deeds, heavy drinking and getting into trouble with the law eventually delivers Harry right into the hands of the USS Enterprise NCC 1701. Sweet talking 'Mudd the First' enjoys avoiding questions, cheating Federation justice and escapes from the nagging, exhausting clutches of his lovely wife Stella! Captain Kirk charges him with stealing a starship but somehow the sneaky devil adapts outwitting even Starfleets quick thinking battle strategist! 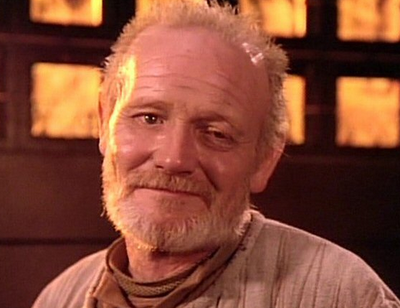 In 2266 Harry's scams include supplying lonely miners with gorgeous wives. Stella would not have approved! However all is not what it seems, apparently. His lovely ladies are transformed into hypnotic beauties by consuming a beauty potion which wears off! In 2267 Mudd's nefarious activities catch up with him. 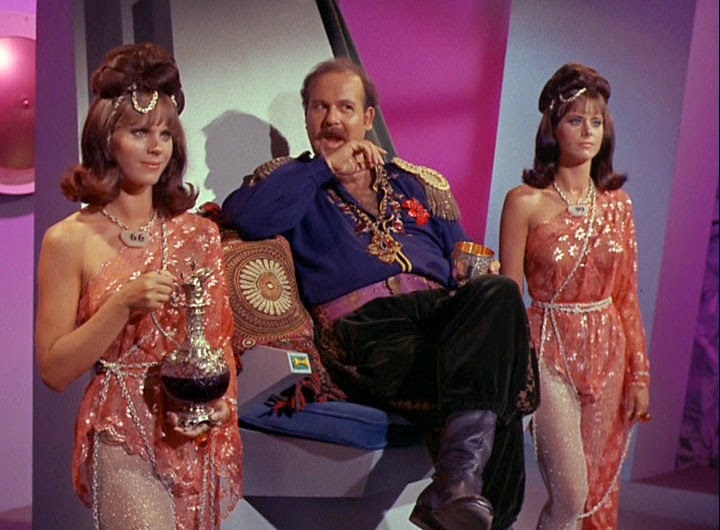 He utilizes techology on an android planet to construct 500 obedient beautiful women, serving and calling him Lord Mudd except theres a catch. The androids won't let him leave. Kirk finally gets even on the ol' scallywag marooning Mudd with 500 nagging Stellas who no longer 'shut up' at his command. Do you feel trapped in marriage? Or are you filled with Love, Hope and Faith? Sadly Ira deteoriates in early 2365. Sweetheart Kareen sends word to the Federation requesting medical treatment but time is running out. Meanwhile, Gravesworld provides the perfect isolation for reclusive Graves until Data turns up with USS Enterprise NCC 1701-D asking questions. The androids curiosity with the preeminent scientist lights up a dying mans eyes. Data immediately takes to the ol' coot calling him Grandpa but the sly dog has concocted a devious plan. All is not what it seems. The mans brilliance has unlocked the secret of transferring his vast intellect and knowledge into a computer! After Datas touching reunion with Grandpa, Graves is beamed aboard the USS Enterprise-D for a fine send off. The enigma deepens when Commander Data steps up to the transporter pad and gives an overblown eulogy at Graves funeral. It doesn't take a genius to realise something is definitely amiss. The face of a thinker, a warrior! Yes, Ira Graves was all that and more but he was not perfect. Perhaps his greatest flaw was that he was too selfless. He cared too much for his fellow man with nary a thought for himself! A man of limitless accomplishments and unbridled modesty. and to love him was to know him. while those who did not know him loved him from afar! F is for friendly angel but who or what is he? The Friendly Angel is a mind controlling Star Trek entity who brainwashes a group of children to take over the USS Enterprise NCC 1701. We find out later his name is Gorgan. Apparently, Angel eyes preys off the negative emotions of his unsuspecting victims corrupting them to do his bidding. Listen to Melvin Belli's magnificent voice (below). This man gained Legendary fame in the United States legal profession as the 'King of Tort.' 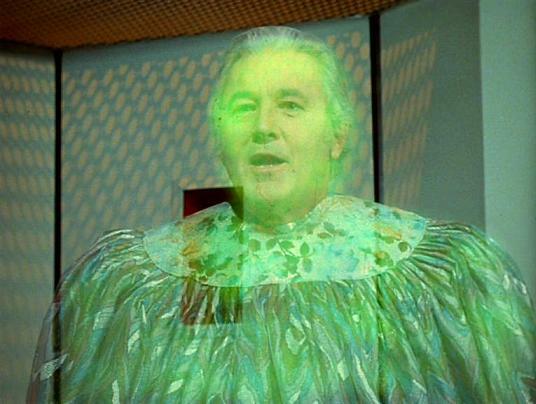 His appearance in the classic series episode "And the Children Shall Lead" as our Friendly Angel, Gorgan is a surprise. When Gorgan's masterplan is exposed, he warns his following that their 'operation' has been discovered but have no fear, call and I will appear! Friends we have reached a moment of crises! The enemy have discovered our operation but they are too late. They no-longer control the ship. We do, we shall prevail! They will take us anyplace we desire. Their beast will serve us well. The fear in each one of them is the fear which which will consume him. Remember how it was on Triacus? If they resist, so shall it be on the Enterprise! our new goal is Marcos12. It is our new beginning, we must not fold! Only love and happiness can stop the Friendly Angel. Is it time to summon the Friendly Angel? Call the angel, we will go. Friendly angel come to me! E is for Edith but who is she? Edith Keeler is played by Joan Collins caught at the center of a temporal accident in Star Trek's City on the Edge of Forever. Her 21st Street Mission helps scores of unemployed people who have reached the end of their rope. 1930's planet earth is a gloomy, primitive culture rocked by hunger, suffering and homelessness. Fighting oppression with hope and encouragement, Edith preaches from her mission's soup kitchen feeding lost unhappy souls wandering in from the streets, inspiring them to believe in a bright future. The Guardian of Forever identifies itself to Kirk and Spock summarizing their predicament. "Your vessel, your beginning. All that you knew is gone." 'Little ms Goodie two-shoes' soon realizes Kirk and Spock are not what they seem. 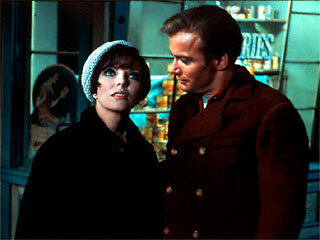 The Mission's angel of mercy is curious about Kirk and Spock who hides his ears under a beanie hood. Trust is the cornerstone of all friendships however Edith soon falls for quiet Kirk and a romance follows. We know from Spock's chat with Captain Kirk that if Edith lives, Earths history will be irrevocably contaminated tipping the balance of power into evil Nazis hands. Imagine the Third Reich winning World War II erasing the United Federation of Planets from cosmic history! How is this possible? 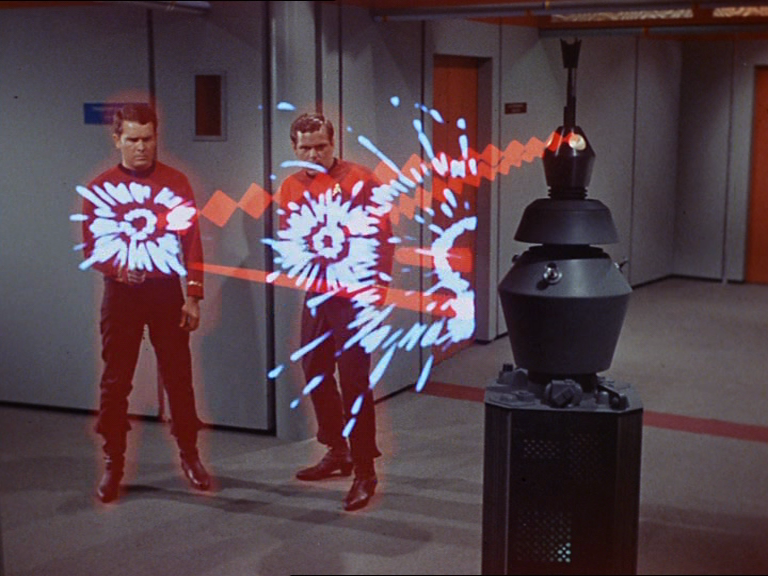 Spock jumpstarts his tricorder and discovers shocking timeline displacements. 1) Keelers pacifist peace movement convinces Franklin D. Roosevelt to delay the United States entry into World War II with disasterous consequences. 2) Has Dr McCoy's meddling damaged time beyond repair? 3) What if Edith Keeler must die? D is for DeForest Kelly but who is he? DeForest is the lovable, cranky, argumentative Chief Medical Officer from Star Trek's classic series who hates using transporters! Sadly D is no longer with us but his spirit lives on as the emotional country doctor Dr Leonard H. McCoy also played by Karl Urban in Star Trek's 2009 movie. We know from Starfleet's Medical that Dr McCoy donned the uniform in 1966 and cared about patients welfare between sips of saurian brandy, which he only used for medicinal purposes! You can't help but miss the ol' coot who had the heart of a poet and frailties which fans could identify with. DeForest wrote a wonderful long poem called The Big Bird's Dream as a tribute to Gene Roddenberry's Star Trek delighting fans at Star Trek conventions. C is for Chekov but who is he? In classic star trek Walter Koenig appears in the second season beginning with the episode 'Who Mourns for Adonais.' Hes the Navigator aboard the USS Enterprise NCC 1701. We know from Chekov's jokes that Russians invent all things great and small in Earth history which explains why hes so proud of his Russian heritage. One of Star Trek's mysteries is how Khan Noonien Singh recognizes Chekov when the Russian is captured redhanded in Star Trek II (The Wrath of Khan.) We know the classic Enterprise crew encounter Khan aboard his sleeper ship, the SS Botany Bay in Star Trek's Space Seed episode but heres the kicker. Chekov doesn't get posted to Captain Kirk's USS Enterprise until nine episodes later in season 2!!! Khans famous gloat 'I never forget a face. Mister...Chekov. Isn't it? really begs the question. Where did Khan and Chekov first meet? B is for Boothby but who is he? 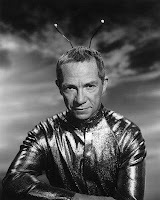 Boothby is Star Trek's grumpy Groundskeeper at Starfleet Academy played by Ray Walston. In 1963-66 Walston also starred in 107 episodes of My Favorite Martian as the sweet talking alien from Mars who lands on planet Earth. Only Boothby's intimate knowledge of Nova Squadron saves the day giving Picard the edge he needs. A real mystery surrounds Joshua Albert's training accident over Titan. Why are Starfleet's elite cadets acting so mysterious and elusive? False testimony about flight plans is definitely hiding something but what is it? Who has the moral fiber to admit what really happened that day?